As we are quickly approaching the week of Christmas, I thought it might be of interest to see what Christmastime was like during the Second World War. The year was 1942. The United States had been at war for just over one year. Fighting was fierce in the Pacific, Africa, and Europe. “American fighting men on faraway fronts fought the enemy at Christmas with successful strokes while the rest of us, back home, made the day an old fashioned, traditional yuletide. Factory wheels were stilled. Millions of families gathered about glittering Christmas trees, exchanged presents and then turned to the usual heavily laden dinner tables. But meanwhile: In New Guinea, American and Australian troops drove two spearheads into Japanese defense lines, thrusts which threatened to cut the Japanese into separated and isolated units. From Guadalcanal, American fliers bombed and strafed Japanese installations at Munda on New Georgia island. They shot down 14 planes and destroyed ten more on the ground. In Tunisia, American troops repulsed two Axis counter-attacks and then drove on to capture a strategic point. But in England, and Ireland, American troops were observing Christmas in another way. They brought a wealth of holiday cheer to numerous gatherings or youngsters who can scarcely remember the days of peace. And thousands of Yanks were guests In British and Irish homes. Most British families tried to find places in the Christmas circles for at least four Americans. Unfortunately, the war would rage for another three years. But, by Christmas 1945, the war was over and the world began to heal once again, assured that 1946 would be better and brighter. 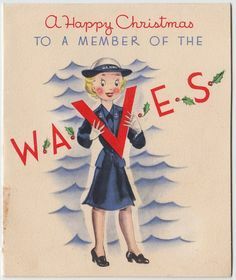 Have a World War II story or Christmas memory you would like to share? Leave it in the comments below! I would love to use a couple of your pictures here. Do I have your permission? Hello! Each image is sourced, so the URLs will take you to the original pages for each image. Thank you!